Thread: Algae that don't clump or mat? I'm interested in using a culture of algae in my gas storage tank to turn at least some of that CO2 into oxygen, or ideally hydrogen, or a combination of the two. 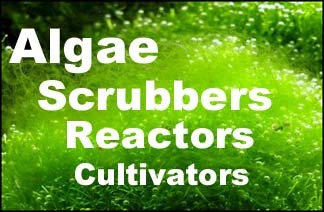 My main worry is the algae forming dense mats or clumps and blocking the system. Is there a culture that I could use that would be happy in the above environment that doesn't clump? If I had 1000 litres of water/algae and use 5-6 aerator stones to bubble 1000 litres of gas through it a day does anyone have a guess as to how much of the CO2 would be turned to oxygen? 1%? 10%? 30%? That uptake info is available somewhere, but I don't have handy links to it. However you can't really choose the type that grows; it will grow what it likes based on conditions. It won't clog though. Just use lots of ribbons for attachment; the gas will always find a pathway up and out.